Saavn is a music streaming website of English, Bollywood and regional Indian music. Though it was launched in the year 2006, the brand got its name coming up after a certain period of time with their effort to produce better experience to the people who used it. Ranbir Kapoor was presented as the Creative Promoter of Saavn in the year 2014 and the star seemed to be happy about the tie-up. In his talks, he said about how he would help Saavn in getting up to date with the new generation music and promotions. He kept his word. As it is evident from the graph, after Ranbir Kapoor was endorsed as the Creative Promoter, Saavn had much more searches on the internet as well as the increased app- downloads. People started to gain interest in the brand as they had their favorite actor promoting the same. 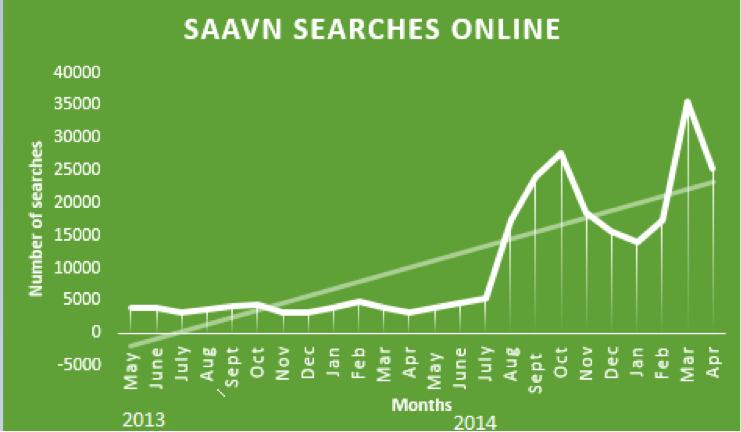 Searches for Saavn in the month of May 2014 did not account to much. It did not rise much until August when RK had his collaboration with the company and his advertisements released. That is, in a span of three months the searches on Saavn rose to 20 K and again in September, it rose to a peak of 30K. Therefore this peak in the search was surely due to RK endorsing the brand and being the Creative Promoter. The young Kapoor did not stop with that. Along with his collaboration with Saavn, he had a commercial released in which the star talked about the benefits of free and legal music streaming. This was also a reason for the increased searches and recognition of the brand. The searches for the brand seemed to be stable until the advertisement came out in January. In January 2015, the searches again went high. The brand moved with the world from then. It created commercials during the World Cup and Valentine’s Day with Ranbir Kapoor’s manner of talk being the sole attraction. One of the commercials being censored seems to have been widely spoken and searched about. The commercials were not too long, but short and crisp so as to just tell the world what they want to and that must have had a great impact on the generation for we do not prefer wasting time. The number of views of the advertisement was very high. 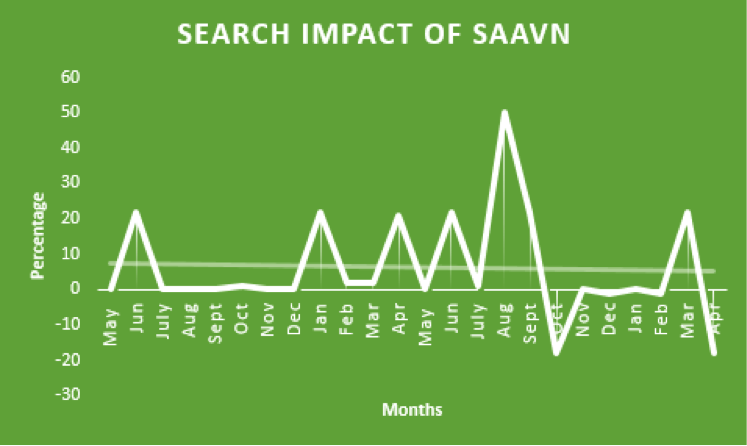 Saavn’s advertisement searches were stable continuously until Feb 2015 when the two advertisements, one for Valentine’s Day and the other regarding the World Cup was released. From 5K searches in January it went up to 7K in a month’s time and to 10K in another month, that is in March. This shows the impact that the advertisement had. This is clearly visible even in the increased searches for Saavn during these months. They made a huge offer for the customers who viewed the advertisement online. Whoever watched the advertisement was able to download songs from Saavn for free. That made a great impact on the audience and as you can see from the graph below, people searched more for ‘Saavn free downloads’ as that search directly led the page to the advertisement. The searches increased from 6500 in August to around 12000 in March. 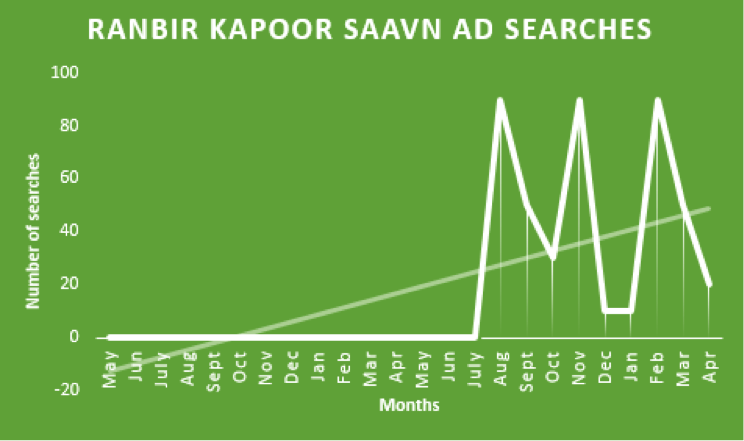 Saavn’s advertisement strategies had an impact on the customers as you may see from the graph given below. The searches for the advertisement was very low until Ranbir Kapoor took over. 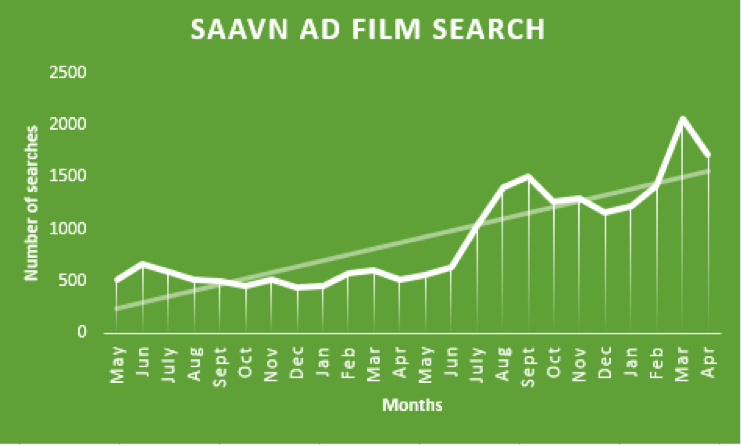 From August 2014, as you may see, the graph rises and after January 2015, when the advertisements have released the graph for Saavn ad film searches hit 2K. Saavn had initially started with movies and later looking at the Indian trends, shifted the focus onto music as they say that they found better opportunities for improving the quality of listening to music than movies They even had a tie-up with Snapdeal during November 2014 where they gave the customers who made mobile purchases the Saavn app free. That must also have added on to the increased searches for the brand as the people who bought the phones would have been curious to know what it was that they were offered by the company. 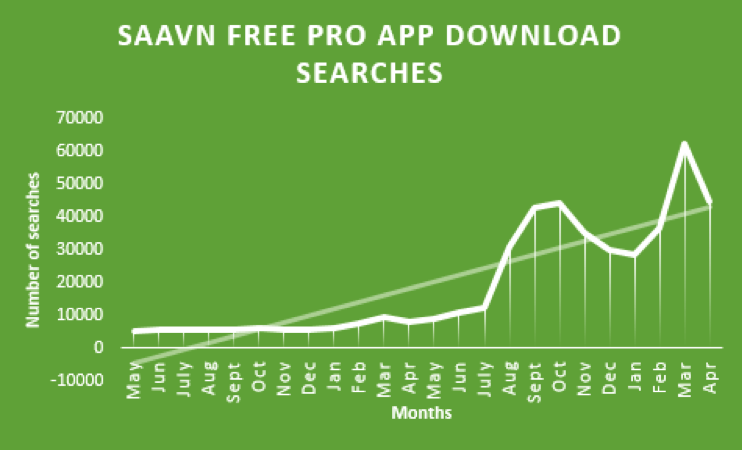 The online search for free Saavn pro app increased as a result. 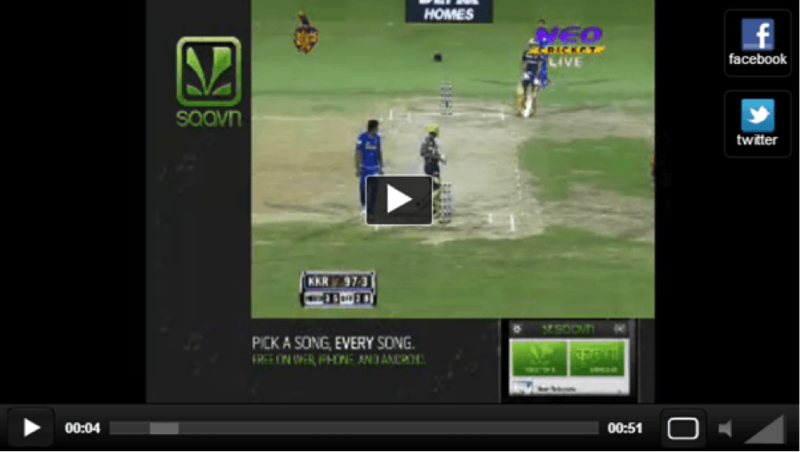 Saavn had sponsored for the IPL Cricket Season in the year 2013, where the company was featured while the game went on. The impact that the sponsorship had on Saavn was low and thereby did not increase the searches for the same. As it is seen from the graph there is no much search impact for Saavn even after the ads were featured. 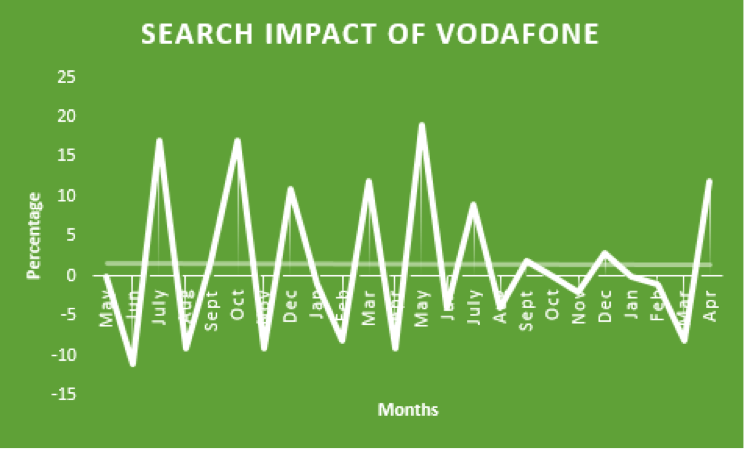 In the case of Vodafone and its ads during IPL, there is a much greater impact on the company. This might account to the tremendous push given by the company in order to bring it to the limelight. There is a huge difference in the manner and number of advertisements made by Saavn and Vodafone. Thus it is not possible for us to totally make a comparison between them. But the advertisements did create an impact on Vodafone when compared to Saavn. It was later that they launched Saavn English and Saavn Pro, considering the people’s interest in independent English music and listening to music offline respectively. There too Saavn met the need of the hour.